The GBP/USD currency pair today fell from its Asian session high of 1.3067 to low of 1.3028 in the American session and was trading near these lows at the time of writing. The currency pair opened today’s session by heading lower before quickly recovering and heading higher for most of the Asian session. The pair went into a steep decline in the early European session as investor sentiment shifted in favor of the bears. The drop was further accelerated by the release of the UK consumer price inflation report for March by the Office for National Statistics at 8:30 GMT. The headline CPI print came in at 0.2% translating into an annualized 1.9% with both prints missing consensus estimates by 0.1%. The retail price index also missed expectations by recording 0.00% growth instead of the expected 0.02% increase. The producer price index was mixed while the house price index came in at 0.6%. The cable’s fall was accelerated by the Brexit stalemate between the Labour Party and the ruling Conservative Party. The positive US trade balance report released by the Census Bureau also contributed to the pair’s drop. The cable’s future performance is likely to be affected by tomorrow’s retail sales data from both the UK and the US dockets. 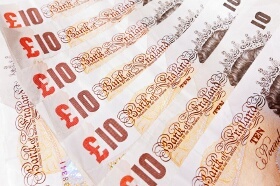 The GBP/USD currency pair was trading at 1.3051 as at 15:12 GMT having fallen from a high of 1.3067. The GBP/JPY currency pair was trading at 146.09 having dropped from a high of 146.36.